I remember that the only time I was able to get Apple Cider Donuts was when I would go apple picking in upstate NY. I used to look forward to that 2-hour car trip, not only for the apples, but because I knew on the 2+ – hour (thanks to the inevitable traffic) car ride home I would be enjoying some freshly made warm donuts. Nowadays, it seems like you can get Apple Cider Donuts just about anywhere. Practically every apple orchard and farm I have visited sells them. Thankfully there are two places not terribly far from me that sell them year-round and both are quite delicious. There are some other places that sell them and they are, well, to be kind, I will say not so delicious. 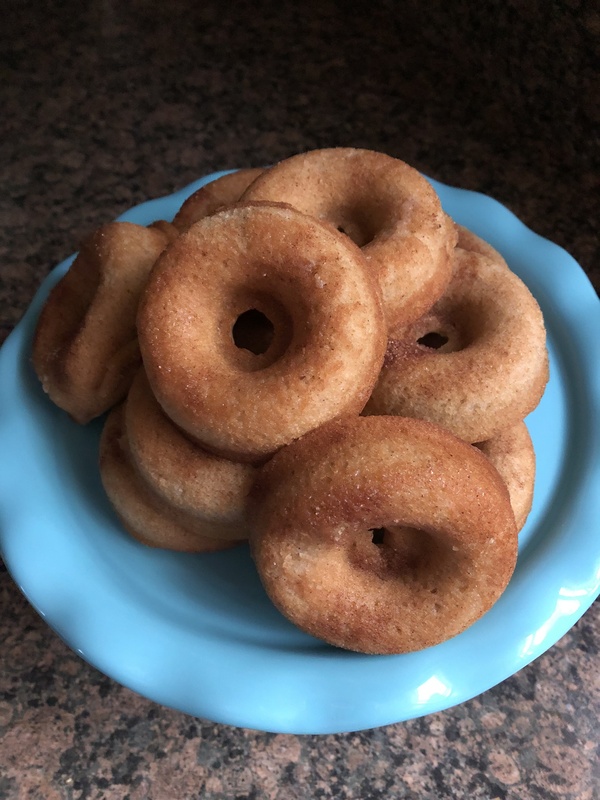 While the Apple Cider Donuts I have had are deep-fried, I have attempted to make my own baked Apple Cider Donuts at home and until recently haven’t been that successful. The recipes I tried usually involved reducing the apple cider and I am not sure if I wasn’t reducing it enough or what, but, they were always a fail. 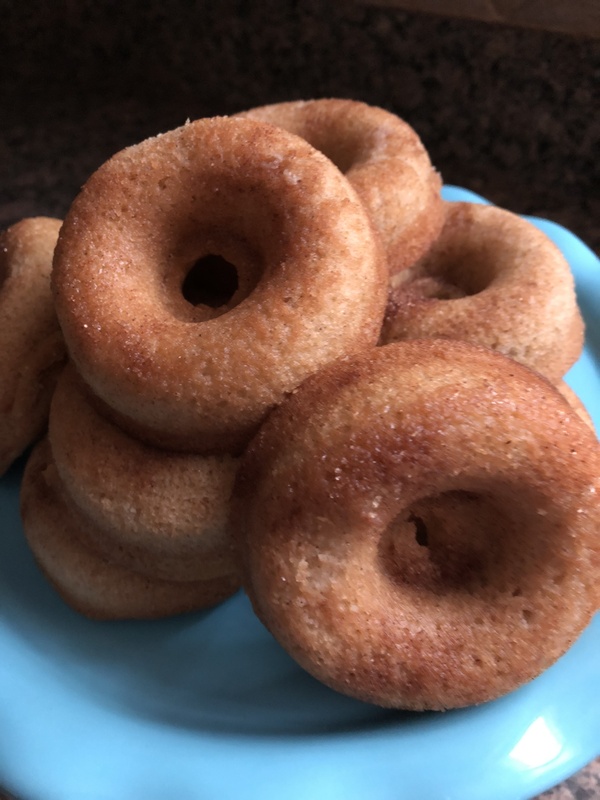 Recently though I came across a recipe that didn’t involve reducing the apple cider and included olive oil that produced a delicious donut that actually stayed fresh & moist for a few days – thanks to said olive oil. I wouldn’t say that these are a perfect substitution to the delicious ones I get upstate, but, they are pretty close. If you are looking for something bite-sized so you don’t feel as guilty (granted, they are fried though! ), check out these Apple Cider Fritters I posted last year. *If you have apple spice, use 1 teaspoon of ground cinnamon & 1 teaspoon of apple pie spice and omit the nutmeg & allspice. Preheat oven to 350 F. Spray donut pans with baking spray and set aside. In a large bowl whisk together the dry ingredients: flour, spices, baking powder, baking soda and salt. In a second large bowl whisk together the sugar, apple cider, olive oil, applesauce, vanilla and eggs. Once well combined, add in the flour mixture and stir to combine. Transfer the batter to the prepared donut pan, filling each cavity three-quarters full. Bake for 18-20 minutes, until a cake tester inserted comes out clean. Let the donuts cool for a few minutes in the pan and then invert onto a wire rack. In a small bowl whisk together the sugar & cinnamon. Brush each donut with the melted butter and the sprinkle the cinnamon sugar on to the donut. Store the donuts in an air tight container.